Edgar Allan Poe is credited with having pioneered the short story, having perfected the tale of psychological horror, and having revolutionised modern poetics. The entirety of Poe's body of imaginative work encompasses detective tales, satires, fables, fantasies, science fiction, verse dramas, and some of the most evocative poetry in the English language. This omnibus edition collects all of Poe's fiction and poetry in a single volume, including The Fall of the House of Usher," "The Tell-Tale Heart," "The Pit and the Pendulum,." "The Raven," "Annabel Lee," the full-length novel "The Narrative of Arthur Gordon Pym of Nantucket", and much more. 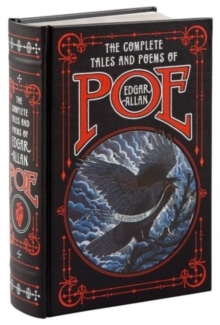 The Complete Tales and Poems of Edgar Allan Poe is part of Barnes & Noble's Leatherbound Classics. Each title in the series presents a classic work in an attractively designed edition bound in genuine bonded leather. These books make elegant additions to any home library.